How have you done evangelism in the past in your church? How have things changed? How must things change moving forward? Crossover has developed a resource to help church leaders and key ministry leaders evaluate and discuss how evangelism in their church has changed in response to a changing culture and how the challenges and opportunities our churches face moving forward will lead us to change. The ‘Our Story’ video is accompanied by a discussion guide entitled ‘Your Story’ which can be downloaded below. You can stream the video from our Vimeo site or download it onto your own device. 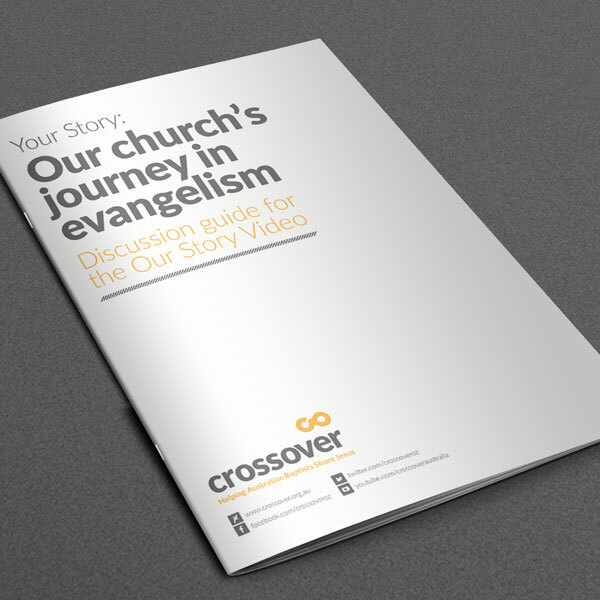 The ‘Our Story’ part is a video that features the founders of Crossover, our State Baptist Leaders and some key Australian Baptist thinkers and theologians. Their contributions, and the accompanying discussion guide, are designed to be a conversation starter so that you can evaluate ‘Your Story’. The key conversation is the one you have in your own church about your own context. Looking back at what we used to do. Considering how we have changed and adapted. Looking forward at how we need to change and adapt. Norm Nix – founding Director of Crossover. Scott Pilgrim – past Director of Crossover. Mike Mills – State Executive Minister, South Australian Baptist Union. Mark Wilson – Director of Ministries, Baptist Churches of Western Australia. Daniel Bullock – Director of Mission & Ministries, Baptist Union of Victoria. David Loder – General Superintendent, Queensland Baptists. John Smith – Superintendent, Tasmanian Baptists. Karina Kreminski – Lecturer in Missional Studies, Morling College. Michael Frost – Vice Principal, Morling College. Keith Jobberns – National Ministries & Crossover Director, Australian Baptist Ministries. Knowing where you’ve come from, knowing where you are, and knowing where you are heading to, is critical when it comes to evangelism. We cannot afford to be in a perpetual state of reaction to our culture. It will serve us better to be in a perpetual state of evaluation and adaptation so that we can contend effectively for the Gospel in a changing culture. We recognise the primary fuel for evangelism is to seek to be empowered by the Holy Spirit, and rely on His wisdom and power. However, it will assist us to be effective contenders for the Gospel in a changing culture if we are able to discuss, evaluate and analyse where we’ve come from, where we now find ourselves, and where we’re headed.